Microsoft Xbox One S with Ultra HD Blu-ray has arrived | What Hi-Fi? Microsoft has taken the wraps off a new version of its Xbox One console. 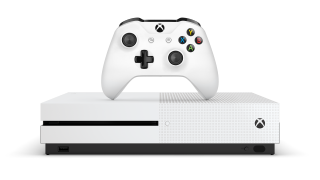 The Xbox One S gives the console new 4K powers, along with a slimmer profile, redesigned controller and capacious 2TB hard drive. Oh, and it's white, "robot white" to be precise. 4K Blu-ray players are in short supply at the moment, with only Panasonic and Samsung currently boasting future-proof decks, but we can now add the first games console to the list. With the amount of 4K HDR content currently on the rise, both online and via Ultra-HD Blu-rays, it's good see another source hit the market. Xbox fans looking for 4K gaming will have to wait until the arrival of Microsoft's next-gen console dubbed 'Project Scorpio', which was teased at the show and should launch just in time for Christmas 2017. The new Xbox One S is 40 per cent smaller than the standard One and despite the smaller dimensions, Microsoft has found space to squeeze in the console's power supply. There'll be no power supply brick clogging up your kit rack. Not a major change, but the console's USB configuration has been tweaked with one of the three ports moved next to the new front-mounted IR blaster. One thing to note is that Microsoft has removed the dedicated Kinect port from the Xbox One S. Instead, you'll have to connect via an Xbox Kinect Adapter for USB which you'll be able get for free if you upgrade from the original Xbox One. There's a new, tweaked controller to match the white finish of the console. Microsoft claims it also has improved wireless range and a more reliable connection compared to the previous Xbox One controller. There's also Bluetooth support if it's used with a compatible Windows 10 device running the Windows Anniversary update. The new controller also gets a new textured grip, and a new thumbstick design which claims to "significantly reduce wear". One comes supplied with the console, with additional controllers costing £50 each. MORE: PS4 Neo vs Xbox One Scorpio: how do they compare? While the special 2TB Launch Edition of the Xbox One S recently sold out, Microsoft has opened pre-orders for a Gears of War themed 2TB console that is available for £400 - £50 more than the white edition - although they have not yet announced when that console will be available for delivery. If you've got already got one too many boxes on your kit rack, the optional Xbox One Vertical Stand could be something to consider, as a $20 optional extra.